One of the most beautiful reserves to the east of Haridwar, Rajaji National Park locates in Pauri Garhwal, Dehradun and Haridwar districts of Uttarakhand. Spread over 820.42 sq. km. of area, the park embraces the Shivaliks, in the vicinity of Himalayan foothills. It’s a haven for the nature and adventure lovers, who visit here to enjoy the real wildlife. It is located in transition zone between moderate western Himalaya and central Himalaya, which increases the species diversity and the viewing forecast. The park has large number of birds species like White-naped Woodpecker, Greater Scaup, Black-bellied Tern, Pallas's Fish Eagle, Great Hornbill, Black-necked Stork, Northern Goshawk, Yellow-billed Blue Magpie, Snowy-browed Flycatcher, Scaly Thrush, Pale-footed Bush Warbler, Tytler's Leaf Warbler, Rusty-flanked Treecreeper, Green Avadavat and Reed Bunting. Rajaji National Park was founded in the year 1983 by merging three sanctuaries named as Rajaji (1948) Motichur (1964) and Chilla (1977), after the name of well-known statesman and freedom fighter Sri C. Rajgopalachariya, who was popular as ‘Rajaji’. He was the first and last Governor General of independent India. 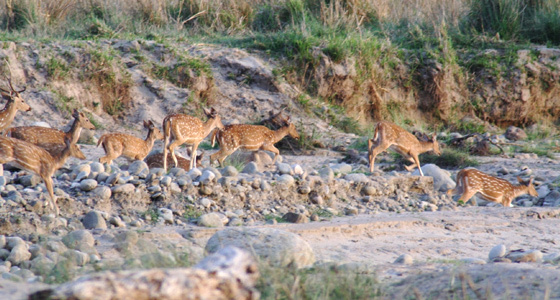 Flora in Rajaji National Park is snuggled between the Indo-Gangetic plains and the Shivalik ranges and Riverine vegetation, broadleaved deciduous forests, grasslands, scrub land and pine forests make the array of flora at these parks. Verdant jungles are home to vibrant wildlife in this park. In addition, there are also some primates that include the Hanuman Langur and the Rhesus Macaque. Small mammals that are mostly found in park are the Indian Hare and the Indian Porcupine. Reptiles in Rajaji include Indian Cobra Pythons, Common Krait, King Cobra, and the Monitor Lizard. There are approx. 315 bird species that give a big visual treat to visitors. Peacock is found in abundance. Large number of butterflies and small birds are also observed that simply add beauty to this region. Some species of birds include Babbler, Rusty cheeked Scimitar, Chestnut-tailed Starling, Golden-spectacled Warbler, Drongo Cuckoo, Brown Hawk-Owl, Great Hornbill, Slaty Headed Parakeets, Red Jungle Fowl, Crested Kingfishers, Lineted Barbet, Black Hooded Oriole, Finches, Khaleej Pheasant, Thrushes and many more. To thrill and experience the wilderness and the richness of species, one has to visit this place and explore the Shiwalik and Himalayan Ranges in Rajaji National Park. Get full adventure and wildlife at this park! 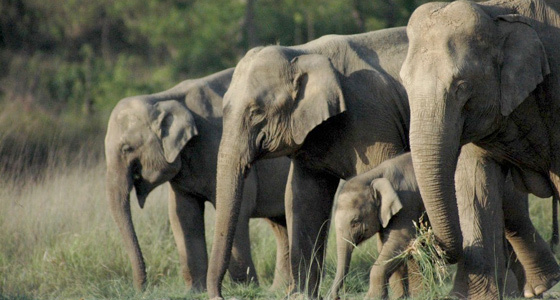 Elephant Safari in Rajaji is one of the best way to explore the striking forest, which is abode to approx. 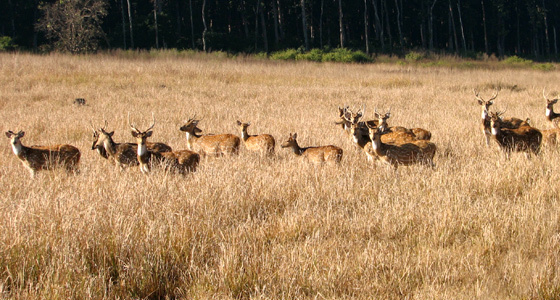 500 wild elephants and a herd of deer, jackals, wild boar, leopards, bears and large number of birds. Jeep Safari is also available there to explore the wildlife of forest. Haridwar- Only 9 Km away from Rajaji, this pilgrimage town is one of the beautiful places where Lord Krishna left his footprint on rock and filled with many holy temples. The place is very popular for Kumbh Mela, in which people from all over the world come to take a dip in holy water. Rishikesh- The city is only 18 km from Rajaji, situated in the foothills of northern himalyas in India. It is popular as ‘The Gateway to the Garhwal Himalayas’ and enclosed by three districts named as Tehri Garhwal, Pauri Garhwal and Haridwar. The Park is having several gates and easily accessible from Haridwar, Rishikesh, Mussoorie and Dehradun. Saharanpur, which is well connected by train to other cities of India, is also a point to reach the Mohand area of the Park within an hour by road. By Air- The nearest airport is Jolly Grant in Dehradun (35km). From Jolly Grant Airport, daily 55 minutes flight from Delhi is available. By Rail- The nearest railway station is Haridwar (24 Km), Rishikesh (18 Km) and Dehradun (56 Km). By Road- The nearest route by bus or car is Delhi (220 km) and Lucknow (510 km) to reach the park. While, Chilla is only 8 Km far from Haridwar Railway Station that is very well connected to main cities and 24 Km from Rishikesh.